• Specially applied to RED DSMC2 video cameras with height within the range of 114mm ~ 177mm. 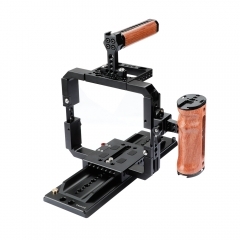 • Full frame cage features extendable side bars with captive screws to avoid accidental falls. 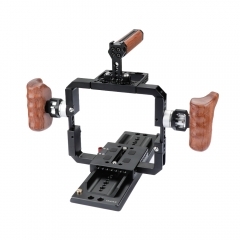 • You can also retain only one side bar and make it a half-frame cage kit to use. 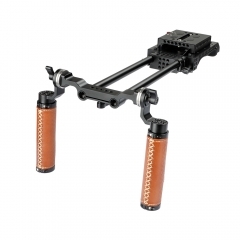 • Comes with a quick release baseplate for easy quick attach & detach of the RED camera. 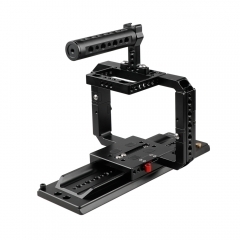 • Comes with a standard Arri 12" sliding dovetail bridge plate for easy stable tracking shot. • Top handle includes multiple threaded holes and cold shoe mount to attach accessories. • It’s made of high quality aluminum alloy and CNC, durable and sturdy. • Plenty of 1/4"-20 and 3/8"-16 mounting points throughout the cage rig. 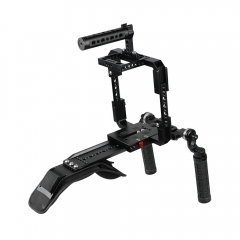 • Specially designed for RED DSMC2 video cameras, which can efficiently avoid and eliminate any microseism or any blur of pictures caused by movement of shake while in shooting, to make your shooting much more stable and clear and professional. 1 x ARRI Sliding Dovetail Bridge Plate 12"